This project was an unusual situation. 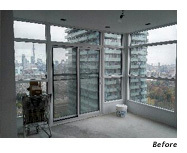 It began as a revamp of a 2-storey penthouse for the owner of this 60's era rental building, in preparation for a new tenant. While the tenant would have some input, my plan was to be generic, in that it would work for anyone able to afford the 3600 square foot apartment. From the outset, we envisioned a great entertaining space, with parties overflowing into a large open kitchen, and walls hung with wonderful art. 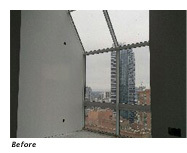 When the project morphed into assisting the tenant to transition to her new home, she proved to be perfectly suited to our vision, and vice versa. Her former home was furnished with ornate French antiques, custom traditional and art deco cabinets, and mid-century pieces both original and reproduction. Her walls were covered with noted photography and artworks amassed over many decades with and by her late husband. 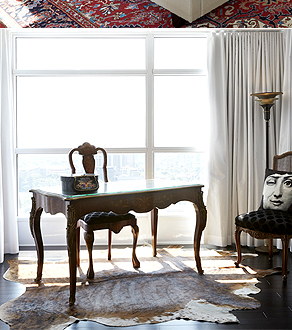 And she herself is a devoted collector of objets and lover of eclectic decor and bright colours. When it came time to edit her belongings for the move, I encouraged her to keep many of the furniture pieces she thought she would have to get rid of. 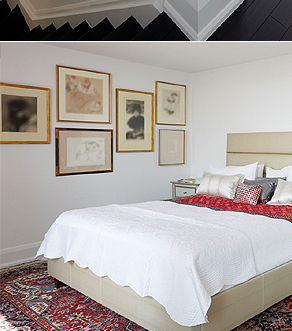 My concept: to layer elements modern, vintage, and old -- inspired by examples of classic New York apartments. 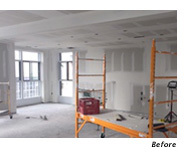 In reimagining the apartment, the building owner had requested that we retain locations of plumbing fixtures, HVAC systems, and structural elements. 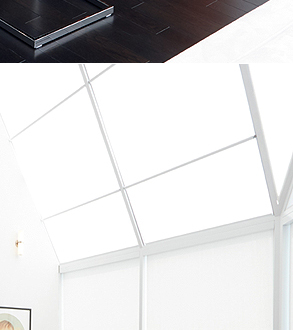 Within these limitations, we were able to eliminate walls from the original plans that had closed off the kitchen and dining room from the rest of the living space. Now, guests who enter the wide 2-storey foyer are drawn in all directions by sights of the city below and beyond. Directly ahead, a vintage Le Corbusier chaise is posed in front of a 2-storey window; to the right, the sleek open kitchen has expansive views to the west; and to the left lies the main living area culminating in a wall of 18-foot greenhouse windows facing south. With the new open concept, the kitchen naturally became an extension of the entertaining space. The tenant/client had requested an all-white kitchen, with flat fronts and minimal details. We selected white high-gloss cabinetry and counters in white quartz to keep things simple and sleek. By sectioning off a generous walk-in pantry at one end of the extra-long room, we were able to create a functional galley layout. 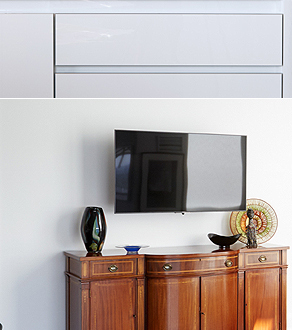 Against the wall, a run of lowers is bookended by tall appliance cabinets, while floating shelves replace standard uppers. A 10'-plus island houses an induction cook-top and features plentiful drawers and pullouts for dishes, utensils and essential ingredients. Since the client rarely cooks, we were able to rely on the ventilation system built into the ceiling, and thus avoid a hood above the stove. With the resulting open sightline from the living room to the kitchen wall, we needed to add some wow to the all-white envelope. 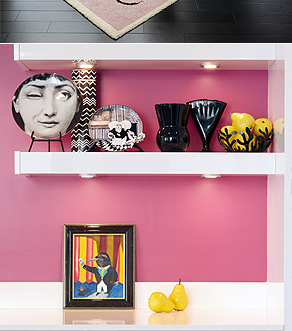 From the start, we envisioned a brightly coloured backdrop, and after considering the client's personality and belongings, fuchsia leapt to mind. 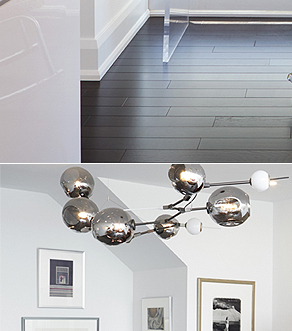 Playing off the room's black doors, we selected black accents in the lighting fixtures - minimalist pendants over the island, a modern chandelier in the breakfast nook, and a whimsical hand-painted black-and-white shade over the sink. 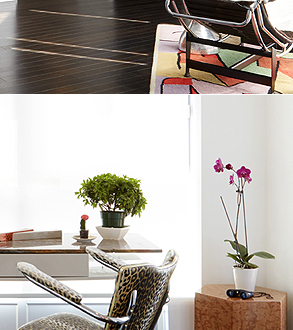 The client has filled the open shelves with a collection of modern glass and black-and-white ceramics. We added more black at the island, in the form of new reproduction Phillipe Starck stools - pieces both comfortable and artistic. 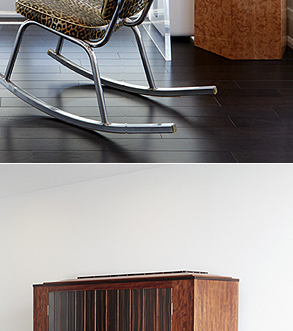 To add natural warmth, we repurposed the client's traditional rosewood buffet as a media cabinet, and repeated the wood elements in a new breakfast table surrounded by black repro mid-century armchairs. A vintage custom acrylic desk topped with rust-coloured stone occupies an inviting corner, accompanied by her Granny's rocker covered in leopard-print. In the main living area, the dining room is defined by its low ceiling. 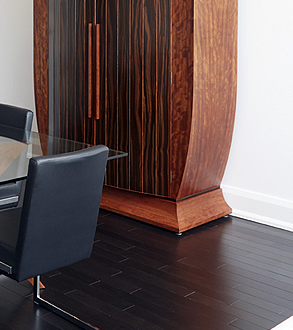 Set against all-white walls, the client's fabulous custom art deco armoire is the highlight of the dining room. Formerly hidden away in the master bedroom, it was dismantled and reassembled by a master carpenter, and is a work of art combining a variety of exotic wood species. Across the room, against the opposite wall, we placed an equally well-crafted art deco chest and a small Regency console for balance. A new contemporary glass table, surrounded by modern chrome and black armchairs, is a silent partner, allowing the cabinet to take centre stage. 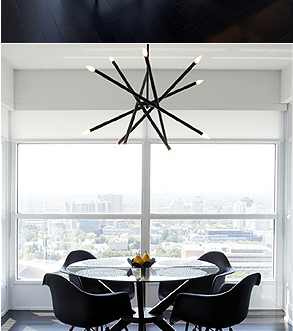 For added drama, we selected a simple yet sculptural modern chandelier that almost spans the length of the 8' table. Beyond the dining area, the ceiling rises dramatically again to a full 2-storeys. 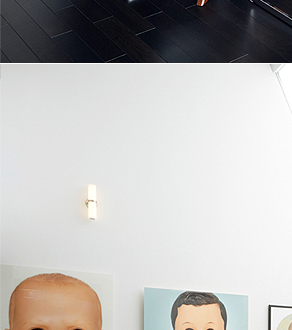 Sconces placed high up on perimeter walls softly light the room, and illuminate a series of oversized artworks. Furnishings are low, making the space feel even higher. Long tufted sofas are covered in neutral pale grey, while a pair of mod chairs can swivel to take in the view. 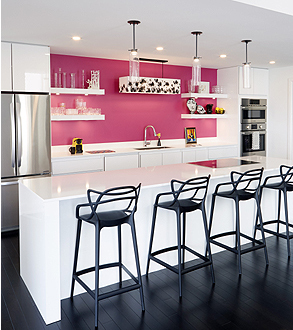 The latter pieces are upholstered in a fuchsia pattern that repeats the kitchen's accent. A selection of bright pillows -- including a couple made from a vintage designer dress -- adds even more colourful exuberance. 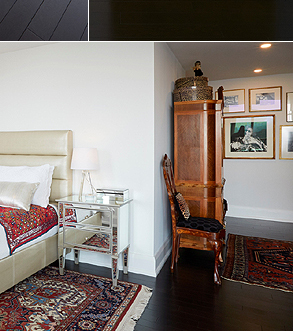 The client found a bold black and fuchsia rug which was originally intended for another room, but made its way here. 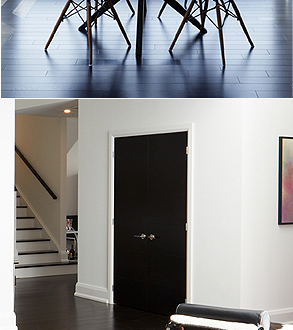 We considered many options for a coffee table, but in the end we used an industrial black metal parsons-style table that the client purchased for her first downtown apartment in the 70's -- a sentimental choice that works. 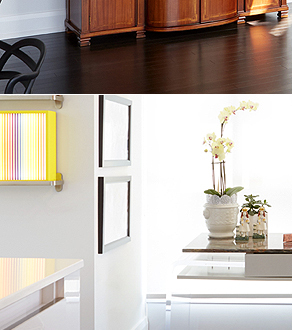 A luminous art glass vase sits atop an end table that we fashioned from a pair of vintage acrylic pedestal bases. The ceiling drops again in the adjoining den, which we partially closed off from the main living area for coziness and sound absorption. 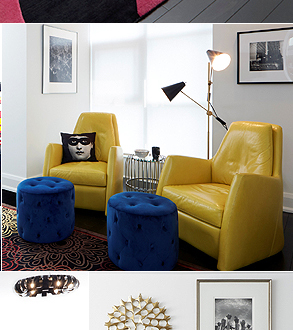 The client fell in love with a pair of lemon yellow leather chairs at a showroom, and these were the jumping off point for the bold use of primary colours contrasted with black. Pulled in from various areas of her former home are a tufted black modern sofa, a vintage repro Brno chair, and a floral rug that suits the room perfectly. 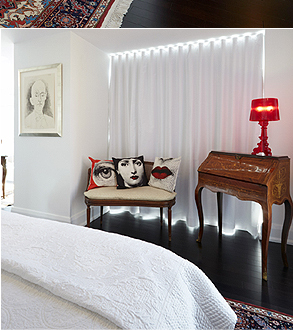 The client's pillows from MOMA, featuring images by Fornasetti and Lichtenstein, add to the retro vibe. Upstairs, an office loft overlooks the living area, sharing the cityscapes through the tall windows. For this room, we selected simple all-white lacquer furniture, with a wall of open shelving to showcase some of the client's collection. 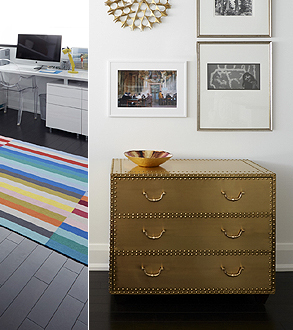 The étagère's walnut accents add warmth, and balance a vintage gold chest of drawers passed down from a friend. 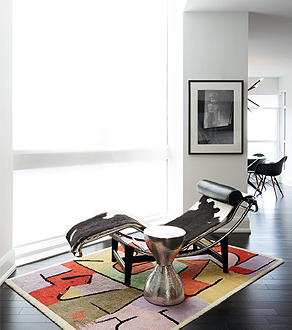 A brightly coloured geometric rug brings together all the colours of the client's whimsical collectibles. The master bedroom is definitely a feminine "boudoir", furnished with a curated collection of French antiques from the client's home -- an elaborate inlaid armoire, a curvaceous writing desk, a petite settee, a delicate secretary -- set against a backdrop of white curtains and walls. To "funkadoodle" it (as the client likes to say), we commissioned a modern bed upholstered in pale gold snakeskin vinyl, which she has dressed with a mix of textiles, including a brightly coloured blanket from India. A couple of her vintage Persian rugs add more brilliant colour to the space, and just to mix it up a bit more, an old cowhide grounds the escritoire. Our mixing of old, new, modern, antique, and vintage has been a huge success. The client is thrilled to have been able to reuse so many of the pieces from her former home -- some pieces that are important and some that are important only to her. 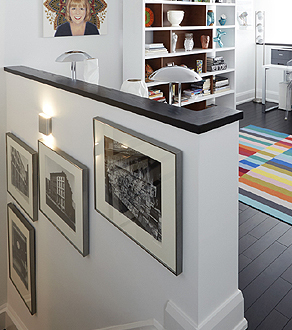 Her art collection is displayed to its full advantage, gracing every room and hallway. While the layout and function of this apartment were designed to suit any prospective occupant, it has truly been made into a home for this particular one and her partner. And I am happy to report that the vision I had when first seeing the space has been realized. We invite you to continue exploring our site for design inspiration, then contact us to find out how we can provide 'just the thing' for you!